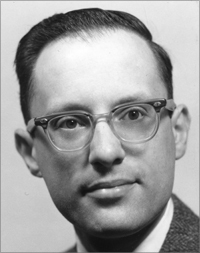 Donald M. Ginsberg was Emeritus Professor of Physics at the University of Illinois, Urbana-Champaign (1959-2007). His research interests included superconductors and thermal conductivity. November 19, 1933Birth, Chicago (Ill.). 1952Obtained BA, University of Chicago, Chicago (Ill.). 1955Obtained BS, University of Chicago, Chicago (Ill.). 1956Obtained MS, University of Chicago, Chicago (Ill.). 1959 – 2007Research Associate and Associate Professor (1959-1966); Professor of Physics (1966-1996); and Emeritus Professor of Physics, University of Illinois, Urbana-Champaign, Urbana (Ill.). 1960Obtained PhD in Physics, University of California, Berkeley, Berkeley (Calif.). 1965 – 1971Visiting Scientist, American Association of Physics Teachers. May 7, 2007Death, Urbana (Ill.). PhD advisor at University of California, Berkeley on superconductivity. Research Associate to Associate Professor; Professor of Physics; and Emeritus Professor of Physics. Received 1998 Oliver E. Buckley Condensed Matter Prize. Obtained BA (1952), BS (1955), and MS (1956). Donald Maurice Ginsberg Physics Today obituary.